The F-35 fighter jet, which Vermont Sen. Bernie Sanders lobbied to have stationed in Burlington. A curious contradiction has emerged between the rivaling supporters of presidential candidates, Hillary Clinton and Sen. Bernie Sanders. While Sanders’ supporters — who tend to be younger and politically further to the left than Clinton’s — are (correctly) quick to point out Clinton’s hawkish foreign policy stands, they remain conspicuously silent on the fact that Sanders’ positions are not much different. Indeed, when it comes to the two candidates’ foreign policy platforms, Sanders and Clinton are virtually indistinguishable. Both would continue the warmongering practices — including the constitutionally dubious use of predator drones, targeted assassinations, and “pre-emptive” strikes — of Barack Obama and George W. Bush. For Sanders’ enthusiastic followers, this constitutes the proverbial elephant in the room. And those who begrudgingly admit their candidate’s “shortcomings” on areas of war and peace, indifferently shrug them off as a “secondary” concern. Such a callous dismissal of anti-war sentiment represents a grave ignorance of the history of socialism, which has long placed opposition to militarism and imperialism — both integral to the implementation and maintenance of global capitalism — front-and-center of its ideology. It is worth recalling that Sanders’ own political hero, Socialist Party candidate, Eugene Debs, was arrested in 1918 for speaking out against World War I, which he derided as a war for Wall Street profits. Debs was charged under the Espionage Act and sentenced to ten years in prison. His sentence was commuted two years later by President Warren Harding, due to Debs’ deteriorating physical and psychological health. Sadly, Bernie Sanders is no Eugene Debs. Sanders, likewise, supported the U.S.-led NATO bombing of Yugoslavia in 1999. And he remains deeply committed to “protecting” the apartheid nation that is Israel. In his home-state of Vermont, Sanders actively pursued defense contractor, Lockheed-Martin to build a $1.2 trillion research plant, replete with 18 F-35 fighter jets, stationed in Burlington to benefit the Vermont National Guard. Sanders, sounding no different from Maine Senator Susan Collins, defends the boondoggle of a project because it “creates jobs.” Never mind that studies have consistently shown that military-production is actually the worst way to create jobs. Sanders, clearly, is no dove when it comes to foreign policy. Yet, this does not seem to bother his liberal supporters one bit. Then again, this is the same bankrupt liberal class that, eight years ago, was equally mum on then-candidate Obama’s open calls to refocus the “war on terror” from Iraq to Afghanistan, which he insisted was the “good” war. Contrary to popular belief, Obama never “opposed” the war in Iraq on moral or legal grounds, but because he considered it a “dumb” war. It was the strategy and execution of the Iraq invasion Obama opposed– not the use of military force itself. Indeed, the great irony of Obama’s presidency is how he managed to get liberals to enthusiastically support many of the same foreign policy practices they vehemently opposed under Bush. Case in point, a 2012 Washington Post-ABC News poll found broad bipartisan support for the president’s use of unmanned predator drones, with “fully 77 percent of liberal Democrats” approving of their use. When it comes to Obama’s penchant for arbitrarily assassinating American citizens, registered Democrats approve of the practice 58-33 percent, and liberals approve 55-35 percent. Then again, liberalism as a political ideology has never been as staunchly anti-war as it is often perceived to be. Consider that all of the major U.S. wars throughout history — World Wars I and II, the Korean War, and Vietnam — have been waged by Democratic presidents. But anti-war sentiment aside, Sanders’ warmongering positions are problematic on a purely economic level. Given the scale of Sanders’ proposed social programs — and corporate pundits’ increasing skepticism as to how, exactly, he would fund them — it is curious he does not make the logical connection between social spending and the bloated, wasteful military-spending budget, which currently accounts for nearly 55 percent of federal discretionary spending (or some $640 billion). 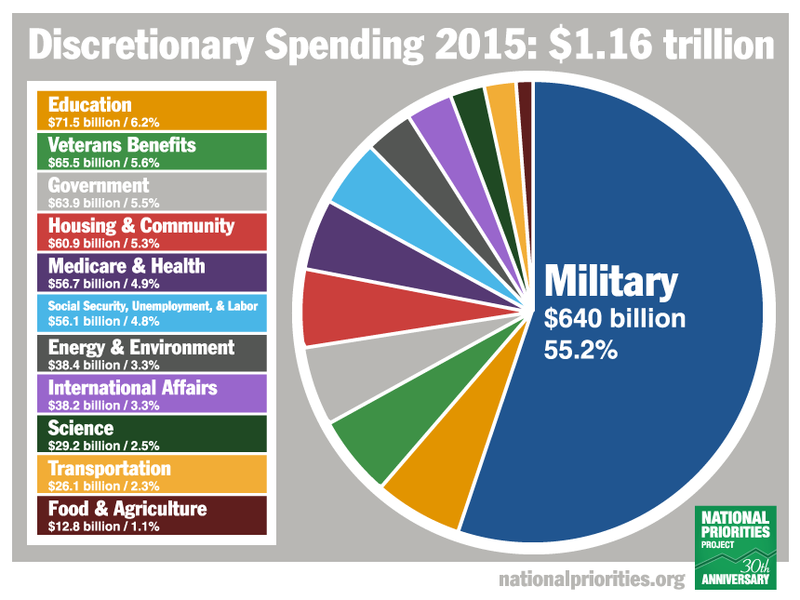 Yet, as anti-war activist and blogger, Bruce Gagnon, observed in a piece for Counterpunch written shortly after Sanders’ visit to Portland last summer, the candidate made no mention of the military budget in his Cross Arena speech. So much, it seems, for political revolution . . . They grabbed what they could get and for the sake of what was to be got. It was just robbery with violence, aggravated murder on a great scale and men going at it blind–as is very proper for those who tackle a darkness. The conquest of the earth, which mostly means the taking it away from those who have a different complexion or slightly flatter noses than ourselves, is not a pretty thing when you look into it too much. But, alas, his imperial heart is just as dark as that of Kurtz, Clinton or any of the clowns in the GOP.